Winduzastikan Empire, commonly known as Winduzastika, is a nation located in the southern half of Alpha's realm and composed of 3 major viceroyalties, which cover more than 30 square kilometers in total. The current government was formed on August 9, 2018, as a result of a civil referendum, while the history of a sovereign Winduzastikan nation goes on since April 2017, starting with the Federation. Territorry losses and conflicts with neighbours led to a situation where Winduzastika was left with basically two major geographical regions which were hard to develop, while more prosperous landmasses were cut off by the borders of newly-formed Ruminian Confederation. This led to an idea of creating a whole new dominion which would be less restricted by such factors - and so, the project of Nalurmetania started in early June 2018. During the following month the city of Daljenstadt was founded and a few nearby yew villages were fortificated and claimed by the government, although all of the work was kept more or less secret until late June. The territorial reformrs consequently led to even more ideas, such as abandoning the empty and hard to reach Venusian lands; transferring the city of Gopinsk to WheatleyMyFriend due to it being pretty much abandoned and territorially/culturally closed to Vitlevsk as a whole; and finally, changing the entire government form to a dualistic monarchy due to the elections being borderline impossible and pretty much useless, and several other factors. The majority of the civilians supported the reforms, and so on a grand conferention on August 9th the Winduzastikan nation was officially reformed and made into an Empire with R. Osmolovsky being the Federal Emperor, and A. Jerdn still leading the Parliament and the Damtserloba party. Winduzastikan Empire is split into 3 major landmasses, all of them being in the southern half of Alpha's Realm - Great Venuzia, Nalurmetania and Masonia. All three of these maintain a certain level of autonomy and a specific status within the nation. Great Venuzia mostly unites the historically Winduzastikan lands located in the middle south-east of Alpha's Realm. It unites 6 major regions and is still home to the majority of the population, even though a lot of regions are heavily underdeveloped, which is more or less caused by the rough climate of the territory or other geographical conditions. Despotism of Borne Sulinowo is a region located in the south-western part of Great Venuzia, which hasn't changed a lot since the Federation times. During the Ruminean Union, most of it was part of the Autonomic state of the Eastern Desert. It is the birthplace of the theoretical Winduzastikan statehood and is one of main current political centers of the region and the entire nation, being steadily developed by this day. The lands are being entirely controlled by R. Osmolovsky, even though individual settlements sometimes can be more or less autonomic. Borne-Sulinowo - capital city of the region, built by R. Osmolovsky in 2016, previously known as MGP Village Windoozastikja. Charmstadt - western-styled village built by Gexon_pane. At some point got more or less ruined during a certain accident, but in 2018 was more or less repaired and is now fairly habitable. Almost directly borders Borne-Sulinowo. Zorrland - a chaotic jungle area bordering Borne-Sulinowo. Mostly used as a plot for different farms. Baomeris - a yew village located in the southern part of the desert. Is directly connected to Borne-Sulinowo by a railroad. Kogorun - a fortress in a hill recognized as an independent settlement. 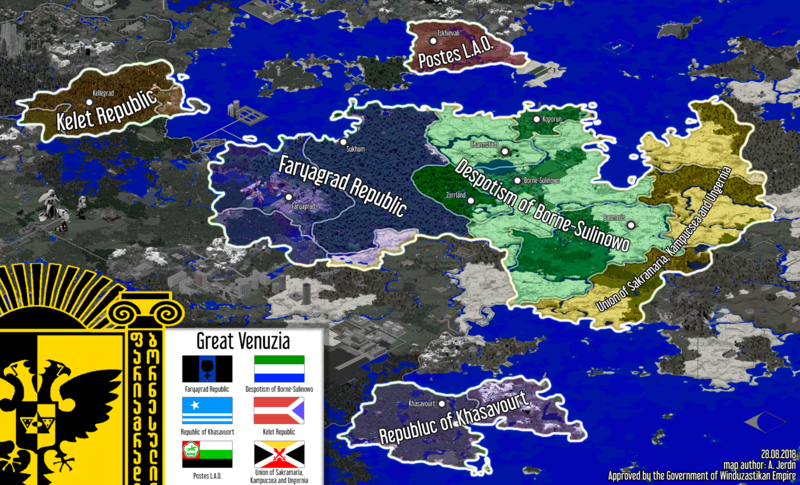 Faryagrad Republic is the second core region of Great Venuzia and is, in fact, one of the oldest ones. It is almost completely covered by a huge jungle and due to this there's still only one proper settlement - Faryagrad itself, which was for a while the capital of the Winduzastikan Federation and Ruminean Union before that. Faryagrad - as previosuly mentioned, the only big settlement in the region built back in June 2016. Slowly being developed and constantly reconstructed. Sukhum - unfinished town on the west made and abandoned by caBst god knows when. Practically empty. Desert/savanna region located on far south-west of Great Venuzia. Attempts to work on it were made several times but currently the region is fairly empty. Postes LAO (Liberális autonóm objektum Postes) is located on a peninsula west of Faryagrad Republic, cut off from the mainland. Was deemed to be the optimal point for the connection to central Alpha's Realm after the estabilishment of Ruminian Confederation, but stayed empty until the foundation of the Empire - development of the region began after the foundation of Ingurland about 400 meters to the west in order to create infrastructure ties and such. Postes City(Tskhinvali? name up to deciding) - the only settlement to be on the territories(for now), currently in progress after its foundation on August 14, 2018. Kelet Republic is a region to the north of the Venuzian mainland, cut off from it in June 2018 after Mussolinivar Megye declared its independence and was annexed by joined the Ruminean Confederation. The region is the only one which borders land of Perdostan. Kellegrad - a small taiga village made and led by Gexon_pane. Khasavyurt Republic is another enclave region counted as a part of Great Venuzia, located to the east of the mainland on the Khasavyurt peninsula. Currently sligtly underdeveloped with its leader, N. Kozinakus, being on a hiatus. There are also plans to connect the Alasigfold mountains, located on the south of Khasavyurt, with Borne-Sulinowo Despotism, which would be possible through a 600 meter bridge. Unfortunately, these plans are indefinitely postponed for now. Khasavyurt - a village originally made by R. Osmolovsky to experiment with a modular building style. Nalurmetania is a huge region located in Alpha's Realm far south. It was discovered in June 2018 and was deemed as an optimal place for territorial expansion due to having huge prosperous lands, 3 yev villages and an island already claimed by one of the residents long ago. Daljenstadt - the capital of the region and Winduzastika as a whole. Located between two mountains, which basically became the origin of the city's name. Although heavily undeveloped, it is home to the biggest building in Winduzastika as a whole and generally serves as a ground for political events. Brascsev - a small town, heavily based on old Romanian architecture. Currently lacks transportation infrastructure which makes it basically cutoff from the rest of Winduzastika - although a bunch of buildings are already finished and ready to be used. Mineszek - planned industrial tower. Planned to be built along with the beginning of mining industry in north-west Nalurmetanian mountains. Might also get connected with a nearby yev village, although these plans are very distant. Masonia is a faraway cold region, located in the map's far south-east. 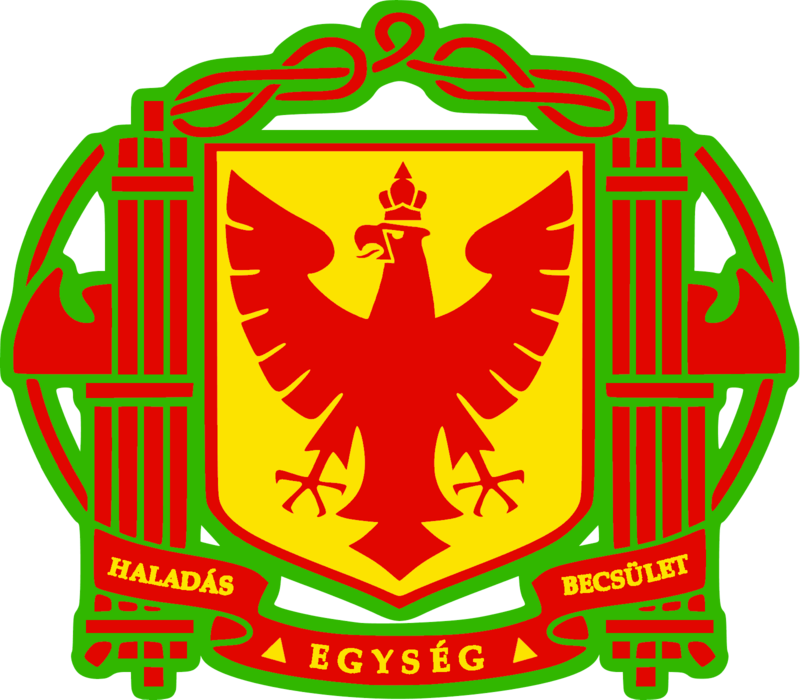 It has been a part of Winduzastika since the early Federation times. Still not connected to the rest of the Winduzastikan lands, although water travel to Nalurmetania is possible. Masomasonsk - old city, capital of Masonia. Culturally very close to Borne-Sulinowo. Fjalland(temporary name, yet to be decided) - town located in a taiga to the west of Masonian mainland. Is currently in development; founded and populated by the Nordic diaspora of Winduzastika. Winduzastikan Empire is a dualistic monarchy, ruled by the Federal Emperor, the title of which is held by Robert “Azalilil” Osmolovsky since the Empire's foundation. Election system isn't estabilished in the nation simply because there is currently no need for it and it would be difficult to realize. The Emperor's decisions are usually agreed upon with the Prime Minister(currently Anhud Jerdn), and within the current government system both have about the same power, though it is not regulated at all. Due to demographical problems a proper Parliament hasn't been estabilished, but citizens are welcome to take part in the nation's political life - for example, the current form of government was chosen by an election, where 100% of voters who did vote at all agreed with the idea of an Empire. Winduzastika will protect the interests of their allies if they are being attacked by other invading countries, but in any other cases the Empire usually isn't willing to start aggression. This is due to several reasons, such as a lot of ongoing projects of other sorts and the way the military is organized. The anti-communist policies are still present, especially considering they were supported by the conflicts with the Ruminians - in April-May 2017 and May 2018. During the Federation times, the relations with the Ruminian Confederation were steadily getting worse by the middle of May due to territorial conflicts and such, which is one of the reasons a reformation of the Winduzastikan nation happened. But in July and the following times Ruminians steadily calmed down, and right now both nations are more or less neutral to each other. The Venesian-Rashidun war gave way to more diplomatic relations with Mondsteinberg, as both sides had to cooperate in order to defeat the enemy, and Crni_Drachen was practically in the head of Ruminian troops during the attack on Venesian Bay. Considering the already lowered tension, this led to a strong alliance - in terms of finances, military, and such. As of now, both Winduzastika and Mondsteinberg are looking forward to collective infrastructure projects and new standardization developments. In June 2018, government of Moloch Worshipping Cult, that soon also became known as the Rashidun Caliphate, was acting aggressively to quite a lot of nations, including Winduzastika. But a few weeks before the Empire's foundation, Onion calmed down and took back all the attack threats, which after a while led to an alliance between both nations. That alliance still persists to this day even though Salah is the new leader of the Cult. Economy of Winduzastika has always been surprisingly stagnant. Usually the government hoards stuff and spends it on the country's infrastructure, but external trading is barely done, with a lot of projects being simply scrapped. Industry also isn't at its best, but a certain income was estabilished shortly after the Empire's foundation due to entrepreneur Em_e_rald developing mining facilities in Nalurmetania and supporting the nation's economy. Since its foundation, Winduzastika was mostly Slavic nation, gathering a handful of people from the former Ruminian Union. It is observated that this group has started becoming ethnically different from northern Ruminians back in 2016 already - with the culture in Faryagrad and Borne-Sulinowo being different from the rest of R.U. - and at some point became its own ethnicity - Faryans. This was pretty much unchanged until October 2018, when with the initiative of Em_e_rald a large influx of mostly Swedish players took its place in Masonia. The diaspora is sometimes called Nordic-Masonians and is not fully integrated with Winduzastikan native culture yet, although it already represents more than 50% of the nation's population as a whole. But the demographic outburst quickly turned into a decline over the next few months due to several factors - mostly due to the announced map change, which led the new projects to a halt with people slowly and steadily losing their intent to do anything. Culture of Winduzastika as a complex of visual internet materials “orbiting” a core of the national community which form the whole socio-cultural paradigm of all the Empire's citizens is built on different internet culture and Hungarian history and traditions, with several layers of slavish national traits, the Georgian linguistical and folklore paradigm, relation to the culture of Finland/Baltic countries, and borrowings from the Arabic and Turkish cultures. Regardless of many sources for the growth of Winduzastikan culture, as of middle of 2018 it's main part consists of arts related to vexillology, linguistics and literature. The culture of the slowly forming nationality was based on fully developed and actively growing Rumino-Faryan culture which basically secluded itself from the rest of Ruminians over time. Its main themes were related to Russian art-house authors such as Biwa Evreev and niggacommunist, which was especially expressed in the Faryan toponymy(cities such as Faryagrad, Gopinsk), and other places with the examples being Faryan Donmak cafe and the currently demolished Gopnik TV museum. Instead of the Hungarian themes, during these times the Finnish culture is more widespread. Before the moment of declaring the Winduzastikan independence, the themes of Shovel Knight videogame were popular among its citizens - and so, the Order of Winduzastika appeared as the first official organization in the nation itself. The Hungarian themes gaining popularity as well. 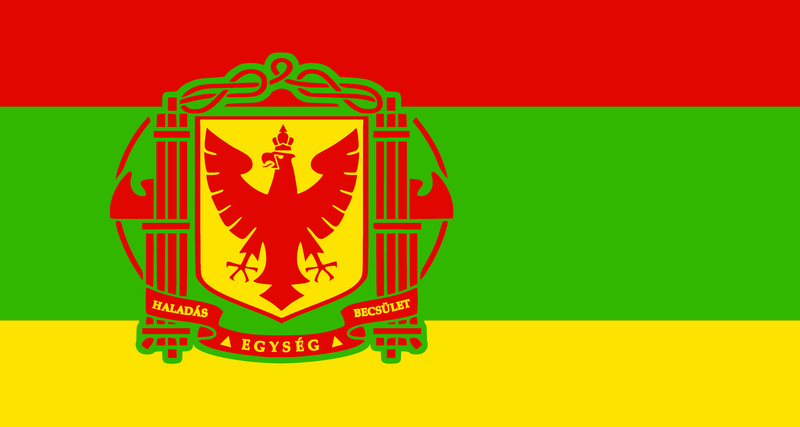 At the end of summer 2017, the vexillological traditions of Winduzastika were pretty much fully developed with the creation of the second national flag and tons of regional ones. In august, with the growing popularity of hungarian songs and military marches, the anthem traditions started growing as well, and on August 1 the first official national anthem was adopted. In the end of December first attempts to create a national language were made with the appearance of so-called ancient-Winduzastikan language and a poem written with it, which was for some time positioned as the national anthem with the music of the Khmer Republic anthem. In January an attempt was made to integrate different parts of Georgian culture into Winduzastikan and with relative success the Georgian writing and cyphering system was implemented; this also brought the name of the ruling party - Damtserloba. There was also an attempt to integrate the culture of native Caucasus people but in most regions it failed. On March 17, the new Winduzastikan language was used for the first time, and since then it actively developed, being based of Hungarian, Yakut languages and many others. Along with all of this, philosophy started to grow and the Turkmens were officially considered to be the ultimate lifeform. Since May 2018 culture of Winduzastika has been more or less the same. The national language was still in development; an anthem of the Empire was also written entirely in Winduzastikan language. A new specific writing was also developed for a little while in September to be used in religious texts and such, but never really took off; an example of such writing can be seen in a carving in Faryagrad. The decline of the server as a whole due to people getting ready to move to a new map in 2019 hit the Winduzastikan culture as a whole. A whole revamp of the language was planned, but due to the aforementioned reasons was pretty much stopped. Architecture also slowed down, and new projects aren't being planned - although the existing cities are being slowly polished wherever possible.